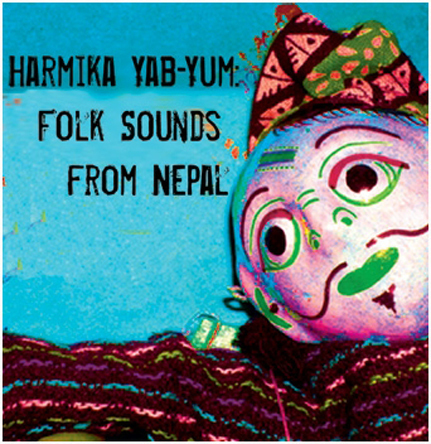 “Harmika Yab Yum” is a divine blend of Radio excerpts and field recordings from Nepal compiled by Robert Millis. This exciting mosaic snares among other oddities, a “King Cobra” snake charmer, the sounds of slaughtering buffaloes and guns firing amidst a Durga Puja festival, dreamy folk music, Sarangi and Harmonium players seeping in from unknown radio signals, pounding drums, praying monks, child choruses, street sermons, loudspeaker promotionals, and quiet footsteps at the top of the world. Millis has produced many curious audio works as a member of the group“Climax Golden Twins” and this collection of Himalayan ephemera captures the timeless beauty of the world’s highest Kingdom, land of the rhododendron, the Kumari (a “living goddess”), and the legendary “Yeti." Recorded in Kathmandu, Pokhara, Gorkha, and other undisclosed locales in 1996.